Camera manufacturer Canon has now launched what it calls ‘the worlds smallest and lightest DSLR’ camera. 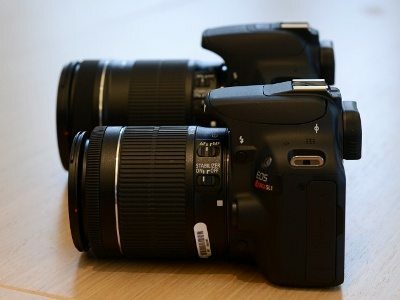 The EOS Rebel SL1 is the latest addition to the EOS range of cameras by the company and it maintains some of Canon’s trademark quality, even though it is roughly 30 percent smaller in size than a regular DSLR. With the EOS Rebel SL1, Canon has managed to shrink the DSLR down to a manageable size, rather than turn the camera into a point-and-shoot. These days people are looking to buy smaller cameras so that they can carry them around easily. The general public would normally want a camera with a high resolution and good battery life as well. With its 18-megapixel quality and touchscreen, this new camera is similar to Canon’s T4i. However, in order to shrink the size of the camera, the battery and the grip take a beating. This results in the SL1 being a bit uneasy to handle. It also has the hybrid APS-C autofocus system on board, with only one cross-type autofocus section. This entry-level camera will set a user back by USD 649.99 without a lens, or USD 799.99 with a kit lens. This allows budding photography enthusiasts to get a chance to play around with an entry-level DSLR camera before going in for the big toys later on.